Kuwait, 28 January, 2018: Talented chefs and expert housekeeping teams from Jumeirah Messilah Beach Hotel & Spa showcased their skills in a series of competitions held at the largest annual Hospitality Show, Horeca Kuwait, winning numerous awards for their outstanding efforts. For the first time, the show presented an opportunity for Housekeeping members to demonstrate their professionalism, hard work and excellence in front of a jury of highly practiced Housekeeping Executives. At the awards ceremony, the Housekeeping Department at the luxurious landmark was recognized with 2 gold, silver and bronze medals for the “perfect bed” display taking into consideration speed, tidiness and presentation. And, for the 4th consecutive year, the skilled culinary team scooped several rewards, returning with honorable achievements of 2 silver and a gold for the pastry team. 1 silver with 6 bronze medals were won by the culinary team competing in Kuwait’s biggest culinary challenge featuring 3-plated dessert displays, Asian live cuisine, live meat and pasta preparations as well as 6-course set menus. 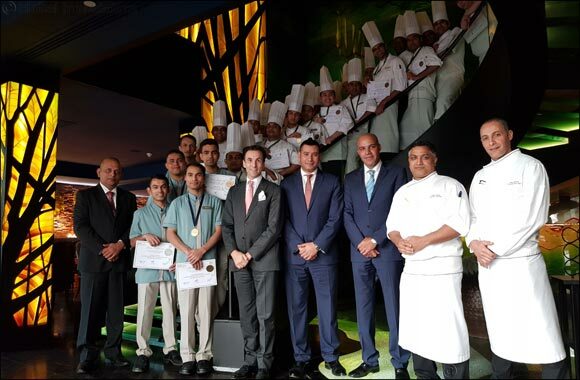 A further 22 merit certificates were awarded to the culinary team for their gastronomic artistry. The back-to-back series of competitions were evaluated by a panel of international chefs from the Middle East and Europe. HORECA Kuwait is an annual Hospitality Show that explores the country’s emerging opportunities in the hospitality and food sector that push the boundaries in quality and innovation across food & beverage, catering, pastry, technology and equipment.